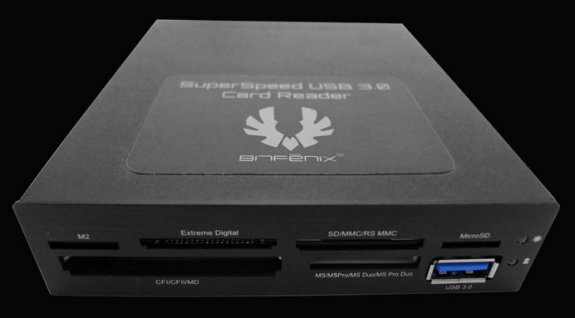 TPU noticed BitFenix has launched a new 35-in-1 memory card reader with USB 3.0 support. The card reader fits in a 3.5" bay but it seems a 5.25" adapter isn't included, which may cause some troubles because high-end cases increasingly lack external 3.5" bays. The product is sold over at Caseking for 23.90EUR. Pictured below, this reader fits into a 3.5-inch bay, has a brushed aluminum bezel, offers support for no less than 35 types of memory cards (from Memory Stick to MMC, SD, CF, and all their variations), and includes one USB 3.0 port that connects to a motherboard's internal header.